The reason behind this politically and emotionally charged move, defined by one oyster industry representative as “a nuclear bomb,” is to reduce the rare but potentially fatal bacterial illness Vibrio vulnificus, contracted by eating raw Gulf Coast oysters. 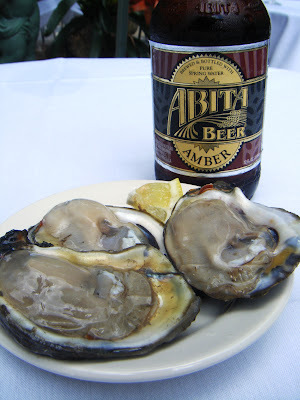 Louisiana oysters and a cold Abita, which I knocked back in New Orleans early this month. Meanwhile, here in Seattle and throughout the Northwest, restaurants are celebrating the joys of slurping raw oysters. Special events include tonight’s oyster fete at Cafe Campagne, oyster promotions at Anchovies & Olives and Flying Fish (which just inaugurated its annual weekday oyster happy hour from 4-6 p.m.) and the upcoming Oyster New Year’s at Elliott’s Oyster House (where you can down umpteen rounds of briny bivalves November 7). All of which might lead you to ask of that FDA ban, “Will Northwest oysters be affected?” and more importantly, “Are our oysters safe?” The short answers: perhaps and yes, according to Robin Downey, executive director of the Pacific Coast Shellfish Growers Association. 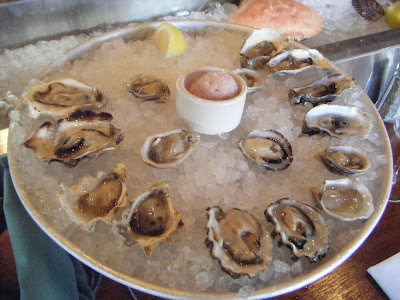 While we occasionally see an increase in oyster-related illness locally due to the naturally occuring bacterium Vibrio parahaemolyticus, “We do not have the Vibrio vulnificus virus found in warm Gulf waters,” said Downey, who represents 140 Western shellfish companies that produce 94 million pounds of live oysters a year, an $84 million business. 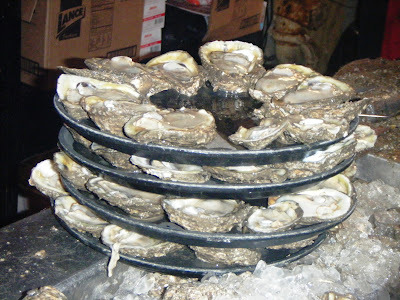 The Gulf oyster bacteria sickens approximately 30 people nationwide annually, resulting in about 15 deaths. Most mortalities occur in individuals with compromised immune systems caused by pre-existing health conditions affecting the liver and kidneys and diseases like cancer, diabetes, and AIDS. Those numbers, while grave, are minuscule compared to other foodborne illnesses, Downey said. Extremely excellent oysters, at Elliott’s Oyster House. That record of excellence is even cited by the FDA on its Website, giving kudos to the Interstate Shellfish Sanitation Conference. The ISSC is a collaborative group including state regulators responsible for implementing regulations at the local level; members from the shellfish industry, the FDA and other federal agencies including the EPA and NOAA. At the Acme Oyster House in New Orleans, raw oysters are slurped as fast as they can shuck ’em. Ask me. I know.